Today, Drew woke up and wanted to be wrapped like a mummy. Brenda, who's the most resourceful person I know, made Drew's wish come true. 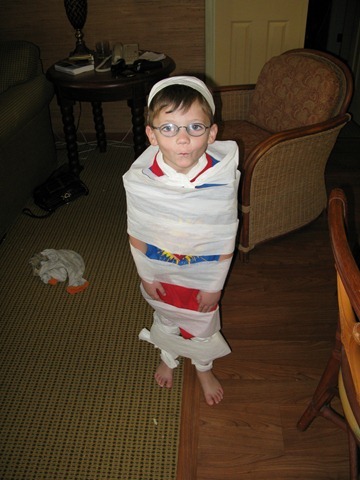 All it took was a little toilet paper. Cameron's wish, on the other hand, was to get his favorite breakfast in Hawaii -- biscuits and gravy. Brenda bought all the ingredients at Safeway on Monday, and she threw together a delicious big breakfast. 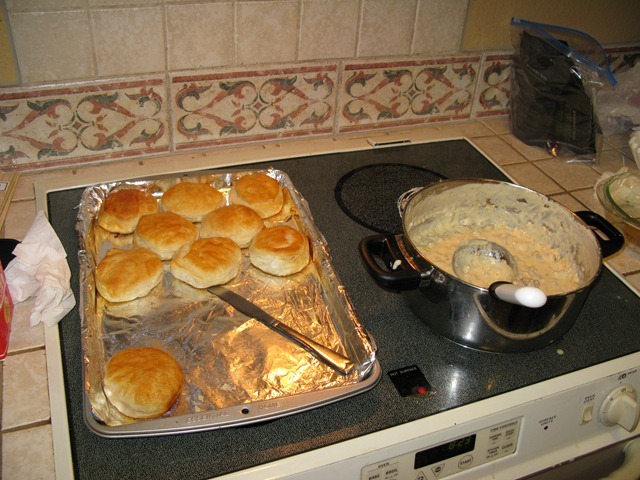 My Mom and Dad were equally impressed with Brenda's culinary skills. After we were fed, all of us headed out in the 6-seat minivan to tour the north part of Kauai. On our drive up highway 56 we ran into road maintenance, which meant one-lane roads and lots of waiting. But none of us seemed to care too much. 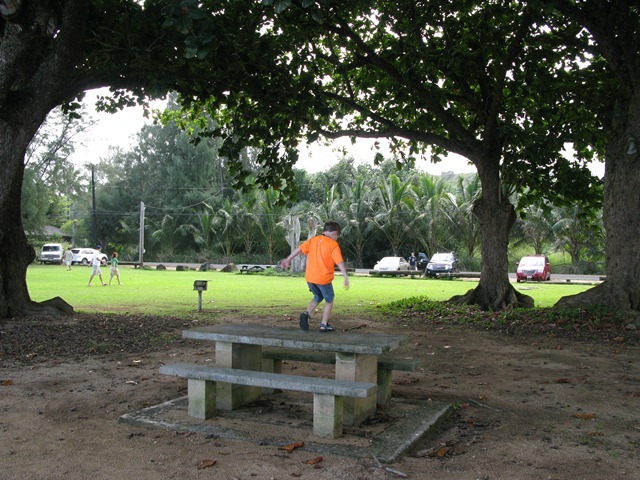 After a few wrong turns, we made it to Anini Beach. 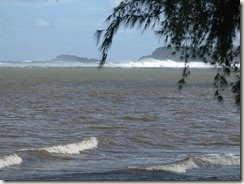 I'd read about a high-surf warning around Kauai the night before, and the waves were crashing all around Anini Beach. Snorkeling on a day like this would be impossible due to the high surf and the murky brown water (my Dad also told us sharks like to attack in water like this). Before we left, Cameron gave us all a tap-dancing demonstration on one of the picnic benches. 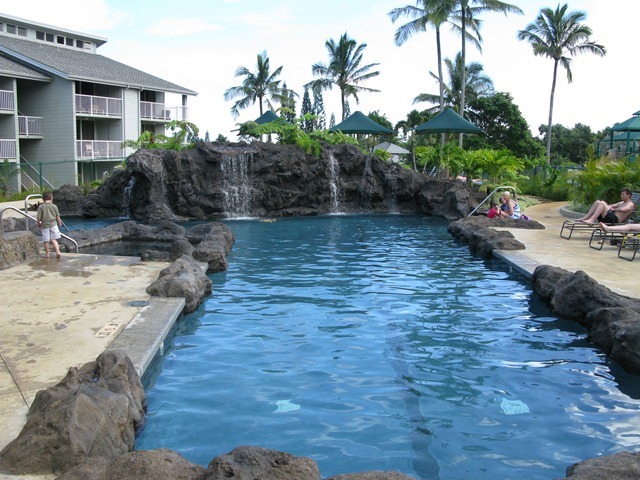 After that, we checked out the Princeville pool, which my Mom said had been remodeled since they'd last stayed there. There's something really inviting about pools with lava rock and waterfalls. It was a little too inviting for Drew, who decided to jump into the water sprayers. We left Princeville and headed to our final destination north, Hanalei. We were all pretty hungry after seeing all that high surf, so we stopped in Ching Young Village and ate at the Polynesia Cafe. This spot ended up being ideal, as they had a lot of different types of food (chicken teriyaki, chili, toasted cheese sandwiches, and fish 'n' chips), and Cameron and Drew could run around in the Village if they got bored (they never did, thanks to all the birds flying around the tables). 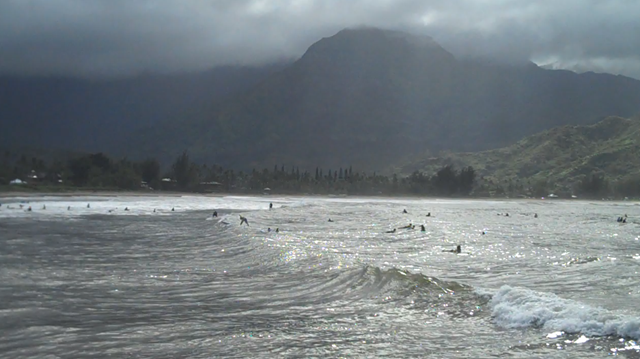 After lunch, we drove to Hanalei Bay so we could watch all the surfers from the pier. There were definitely two levels of surfers here: those near the shore, and those out in the Big Waves, assisted by jet skis. Cameron looked at all the kids trying to surf and longed to get out there himself. 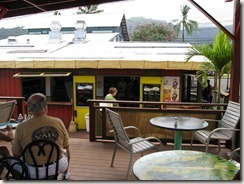 We left Hanalei and drove straight back to Kapa'a, which took about half the time as driving up (no construction). 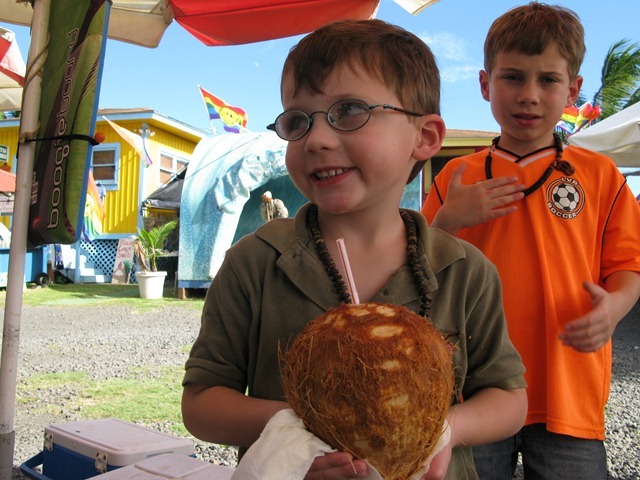 We stopped at a Farmers' Market and Brenda found the boys coconuts! 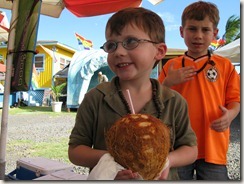 The farmer cut a hole in the chilled coconuts so the boys could drink the coconut juice (not to be confused with coconut milk). It was pretty refreshing in afternoon heat, but no one could finish theirs. The farmer cut out the coconut meat for us, and my Dad also bought the biggest avocado any of us had ever seen (I forgot to take a picture). All in all, a pretty good day on Kauai.